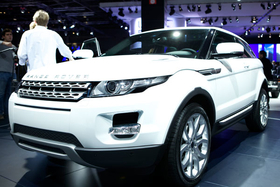 The Range Rover Evoque five-door is expected to debut in Los Angeles in November. The three-door (shown) was unveiled in Paris. The Range Rover Evoque won't be limited to a three-door version. Land Rover plans a five-door Evoque for those who need a little more utility from their SUV. The five-door Evoque is expected to debut at the Los Angeles auto show in November. The Evoque will be the British SUV maker's smallest model and is part of the company's plan for bringing new customers to the brand. Sales start in Europe next summer and in the United States a few months later. The Evoque is shorter than the Range Rover Sport and lower. It is constructed with lightweight materials and will be available with a full-size panoramic sunroof. The Evoque will sit on a modified version of the Land Rover LR2 platform.